This entry was posted in knitting and tagged baby, fiber arts, fiber arts friday, finished object friday, nablopomo, photograph, recycled, Sprout, sweater, upcycled. Bookmark the permalink. It’s BEAUTIFUL! Not only do I want this for my boys, I want one for myself as well. I love it! It looks gorgeous on him! aw that’s a really pretty sweater and he looks gorg. Also, congrats on finishing NaBloPoMo! What a fantastic sweater. And a great color, especially for the holidays. Yeah, I’m really pleased with how it came out! OMG!!!!! 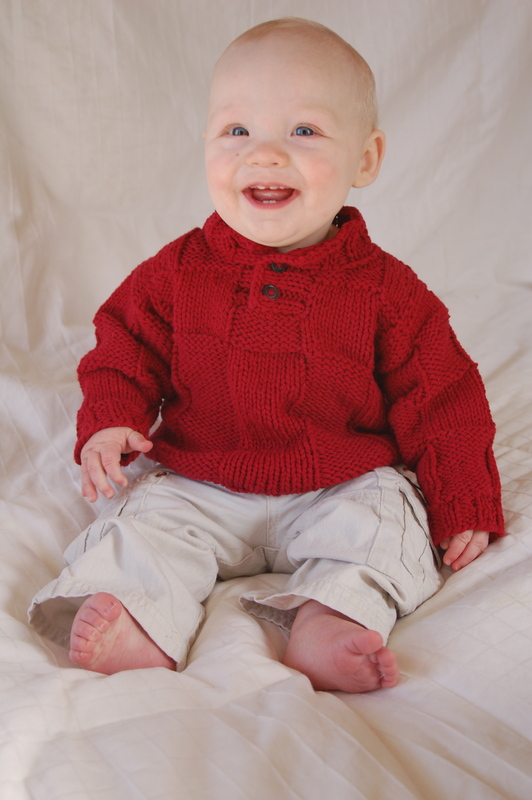 See–this is why I need to learn how to knit. Asa looks adorable (he is just so photogenic!) and I love the red. Love it! I wish I had some talent in this department! Ahh, love the sweater and it looks great on him!